Look, we know the field of Dietetics can be overwhelming, espcially the famous internship...dun dun duunnn. Get that tachycardia under control because we're here to help walk you through the process and better market yourself! What 6 characteristics internships directors are looking for in your application. Which volunteer experiences stand out and how to use those to make your essay unique. The skills you can practice now to impress your future preceptors. 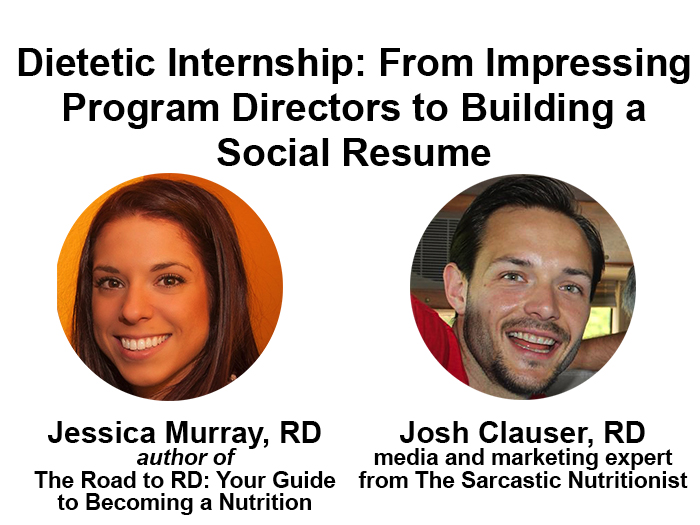 Create a social resume to better market yourself in the field of dietetics. Start a personal nutrition blog. Jessica Murray, RD CD CPT is a Registered Dietitian and ACSM Certified Personal Trainer who earned her Bachelor’s from Montana State University in 2010. Since graduation she has worked her way up from the dishroom to clinical dietitian in private and military hospitals. Her clients and patients have benefitted from her creative use of technology to deliver nutrition education in both hospital and private practice settings. In 2015, she published the book “Road to RD: Your Guide to Becoming a Nutrition Expert” to give nutrition students an all-in-one resource to improve their chances of landing an internship and reaching their goal of becoming an RD. Though she is known as a workaholic to her friends and husband, in her downtime she trains for half marathons with her labradoodle, Roxy, helps her husband with his homebrewing, and craves quality time out in the woods for hiking, hunting, and target shooting. Josh Clauser, MS, RD is a Registered Dietitian who earned his Masters degree from Ball State University in 2007. Since then he has utilized his experience in nutrition within community based settings, clinical hospital settings, education systems, and university programming. He has taught youth of all ages; kindergarten through undergraduate level programs at the University of Connecticut. Lately he has been working on data analysis, marketing, and programming. Most recently he has launched his own consulting business in order to help fellow dietitians develop and promote themselves through web based media and marketing. Aside from his professional career, Josh is highly involved in social media and marketing development. He recently completed his first marathon and lives for a large, strong, cup of coffee at Starbucks. Life’s too short to be so serious. Josh makes it a priority to keep the fun and excitement in the dietetics field.